Download-and-print. Includes picture round built into the play sheets (minimizes printing). One person acts as quizmaster, everyone else plays (either individually or as a team). 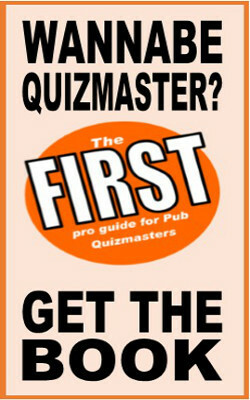 A fully formatted quiz night with excellent questions and an exciting format which guarantees a close finish. The questions are carefully selected to be challenging for brainiacs while being accesible for novices. This is a download-and-print quiz night. Print out sheets required (one per team). The level of difficulty is nicely set between too-easy and too-hard. Everyone should be able to compete and everyone should be challenged. and guaranteed to be correct. Who Can Be The QM? Instructions are easy-to-follow. Anyone who can read should be able to act as quizmaster. The questions in the Dr Paul Quiz Night are thoroughly well fact-checkedand reserached. But you are also provided with web references for every question so that in unlikely event of any dispute between players, you can quickly check it out. As far as I'm aware, no other download-and-print quiz provider offers this level of checks on the factuality of the questions. You can trust Dr Paul! The whole quiz is prepared by Dr Paul, Edinburgh-based quiz legend who uses 20 years of experience writing questions and running popular pub quizzes to know what material to put in and what to leave out.